The majority of the emails, comments, messages and questions I get from direct sellers and network marketers are about FEAR. The biggest fear seems to be the fear of getting no’s, fear of rejection, fear of sharing their business with others and fear that others will think you are being spammy and salesy. 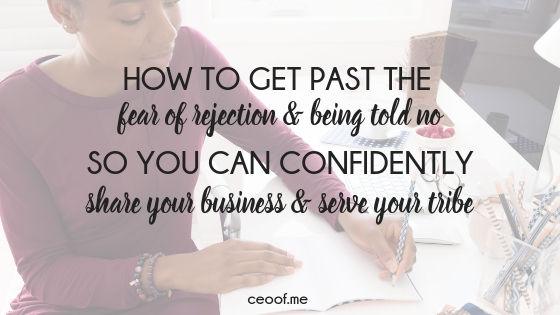 I want to tell you how to easily get past your fear of rejection, of being told no and worrying what people are thinking about you so that you can confidently share about your business and serve your tribe. This is where having your own definition of success that’s personal to YOU, not tied to a #, $ or title or anyone else’s idea of success is so important AND where YOU learn to focus on finding & get committed to serving, sharing, helping & finding those people YOU are meant to help, that need, love, can’t wait for what you have to offer is essential! 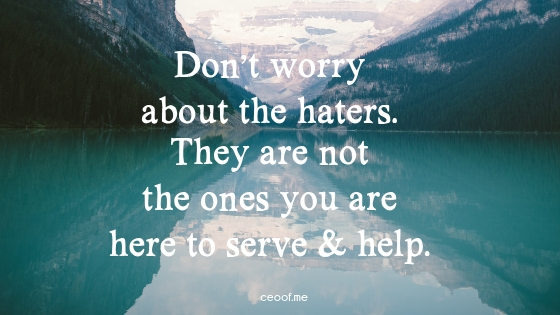 You are not here to serve the haters, and putting your energy towards them & worrying about the no’s and getting tangled up in other’s opinions is just like being stuck in a spiderweb and waiting to get bit…. Free yourself from it, shift your mindset & your focus & fly away! I got more no’s than I could count in my DS biz. I got past it by simply focusing on sharing information and being so passionate about helping people that it wasn’t about the no’s at all, it was just about sharing information and finding more of the right people. I get rejected still in my coaching biz too. I had someone comment just recently on 1 of my posts on my page about 1 of my products that it was too expensive (and it’s actually one of my lowest price products lol!) and said they could get free training from some other coach. What a waste of time that would have been to let 1 little comment, 2 sentences ruin my whole day, take me away from doing the work I am called to do, from helping the people who need what I have to share? The new me, just deleted her comment & blessed & released. Then I got back to work SERVING you guys & the rest of my tribe! 🙂 No need to try to convince someone else. She clearly has some money mindset issues and blocks and is obviously not my ideal customer. No biggie. Her choice to feel that way. It’s my choice to bless and release too. So which option is better letting a no stop you (or even just the fear of getting a no) OR staying focusing on helping those who need your help & blessing & releasing anyone who decides they aren’t interested in what you offer? You can’t control how people are going to react but you can choose how you deal with that reaction. The more time you spend worrying about getting a no or worrying after you get a no, that’s just time WASTED that you could instead be spending serving, finding, connecting, helping the people who do love, want, need & can’t wait to have what you are offering. I hope this helps you shift your mindset about these fears and empowers you to focus on serving, helping & finding more of YOUR TRIBE. They are out there and they can’t wait for you to connect with them.